She is considered to be the Lady of the house. Her symbol is kite, crow, bones, and skulls. Depictions showed Nephthys as a woman wearing the symbol of her name on her head or her symbol on top of a pair of horns. Her name, Nebt-Het, means “lady of the house,” house being the sky where Horus lived. According to myth, Nephthys was the daughter of Geb and Nut, the sister of Osiris and Isis, and the sister and wife of Seth. Throughout Egyptian mythology, Nephthys was always the counterpart to Seth. Nonetheless, Nephthys had a son, Anubis, by Osiris who was seduced by Nephthys after she got him drunk. This field Seth`s desire to kill Osiris. Nephthys is portrayed as a loyal friend to her sister, Isis, who helped her search for Osiris’ body after his death and who rebuilt Osiris’ body once it was found. He is the Sky. His symbol is stars, the night sky, and cows. Depictions showed Nut as a woman wearing a vase of water on her head with her hands and feet touching the ground to form an arch. This arch or semi-circle represents the sky and heaven. Her father the god of air (Shu) holds Nut, the sky, above her husband, Geb the earth. According to myth if Shu ever left his duty chaos would return. A nut was the goddess of the daytime sky and later the goddess of the entire sky and was the place where clouds formed. Her father and mother were Shu and Tefnut. Her husband was the earth Ancient Egyptian Gods Geb, with whom she had four children Osiris, Isis Seth and Nephthys. Considered to be the King of the dead. His symbols are a crook and flail, Bennu (Phoenix), died, White and Atef Crowns, bull, mummified form. Depictions of Osiris showed the god as green-faced and bearded holding the flail and crook in his hands. He was portrayed as a mummified human who wore the Atef crown. He is considered to be the Ancient Egyptian Gods of vegetation. He brought civilization in Egypt. As the king of the underworld, Osiris admitted only those souls who had lived good lives and who had received the proper burial rights under the protection of certain amulets and the recitation of certain words of power and divinity. He was killed by his brother Seth who was jealous by him. But Isis his wife recovered the body and brought him to life with magical powers long enough to conceive Horus who later took revenge of his father’s death and then ruled Egypt. Considered to be the Father of the gods. His symbol is a sun, falcon, obelisk, pyramid, Udjat (Eye of Horus), Bennu (Phoenix). Depictions of Re showed him as a hawk or falcon or hawk-headed man. Some depictions showed Re as the combination of Ra-Hoor-Khuit (Re who is Horus of the Horizons) and Horus, the falcon god. Considered to be Mighty One. Her symbol is the lioness, cobra, Udjat (Eye of Horus).The lioness goddess of war and destruction, Sekhmet was depicted as a woman in red with the head of a lioness with the solar disk and the uraeus on her head. The name Sekhmet comes from the Egyptian word Sekhem meaning “to be violent, mighty, and strong.” Together Sekhmet and Bastet were the Goddesses of East (Bastet) and West (Sekhmet). Sekhmet was born out of the fire of Re eye. Recreated Sekhmet as a weapon of vengeance with which to destroy disobedient and wicked men. The ancient Egyptians feared the powers of Sekhmet and developed complicated rituals to appease the goddess. Re had a change of heart and no longer wanted to destroy men, but could not stop his daughter from killing them. Instead of destroying Sekhmet, Re tricked her by disguising beer as blood which Sekhmet drunk. Sekhmet became so intoxicated that she could no longer kill men and was from then on known as Hathor. He is considered to be the Lord of Upper Egypt. His symbol is donkeys, fish, pigs, Seth-animal. Depictions of Seth showed him as a mythical animal resembling a donkey or aardvark. He has big ears and red hair.Seth was the Ancient Egyptian Gods of thunder and storms as well as the desert. 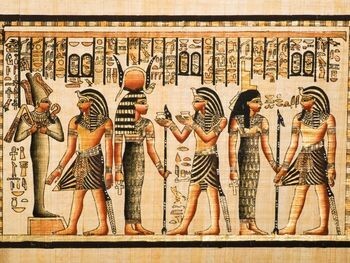 His parents were Nut and Geb, his brother was Osiris and his sisters were Isis and Nephthys. Though married to Nephthys, Seth never had any children, a fact that contributes to his association with the barren desert and infertility. He killed Osiris and later he was killed by Horus son of Osiris.